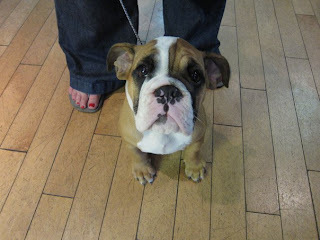 What is it about bulldogs? I can always count on them to make me laugh. But I’m not laughing at them, I swear – I’m laughing with them! Or at least, I have to be laughing with whomever or whatever humorous force created them. May-Elizabeth is a super-sweetie, will lick your face off but is nervous at first and often avoids big groups of dogs. When you approach her because you just want to squeeze her up into a little butterball, she starts wiggling and scriggling in anticipation – without moving any closer to you – while you’re still at least 20 feet away. Beula has two metal spikes, one in each back leg! Basically her back knees are fused straight by operations, so she has some trouble getting around. That doesn’t stop her charging at the hose though! 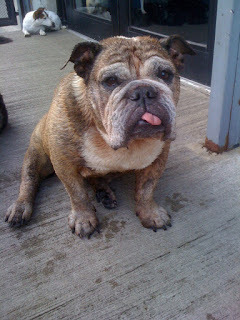 She snorts and snuffles in her old age, bulldog-willing to get that hose, no matter how exhausted she is! Yeah, her tongue is kinda stuck that way. Gilda is a recent graduate from Calm Energy Obedience Class out of Cheeky Dog Daycare in Dumbo, Brooklyn. She’s still a pup and has that mixture of bulldog-exhaustion with puppy energy. She wins for most squishy face I’ve ever seen or felt, to date. Bulldogs are some of the most loyal, loving, and hilarious dogs on the planet. But the colloquial meaning of “bulldog”- as in “My boss is a bulldog; he just won’t take no for an answer!” – doesn’t come from nowhere! They were originally bred for jaws that could latch on to an intimidating predator – such as a bull – and just not ease up, never letting go. 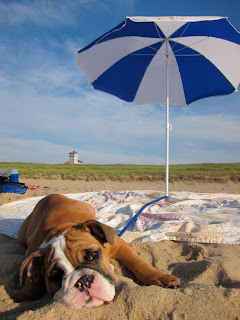 In my experience, bulldogs are just as stubborn in other areas of life, with other dogs as well as with their owners, and they need firm, calm, consistent leadership with rules and boundaries regularly enforced or their willfulness will simply take over your life. I first got to know the nature of bulldogs in the doggie daycare where I once worked. There were several gates that the dog-handlers would have to open and close to let various dogs in and out of various spaces, according to their size, temperament, and which were being picked up or dropped off; and it was always a bit of a circus-act trying to get the desired dog or two out of the pack of twenty or thirty through the gates without letting any of the others through (and wherever you are, and whatever gate you happen to be opening, be sure the dogs think it’s the greatest place in the world to be and the most desirable gate to go through ever opened). But the bulldogs were particularly tricky. I remember the first time I opened the gate and three of the bulldogs were sitting too close, blocking the entry, so I pushed one of them back with my knee – Cosmo was his name. Not a smart move! Though Cosmo had been sitting peacefully just watching moments before, along with the others, that message to “back up” was all Cosmo needed to decide that forward was undoubtedly the direction he wanted to go! He shoved and garumphed, and made the whole process much more difficult; especially since the other dogs of course decided Cosmo must know something they didn’t, and that there must be something really delicious and desirable on the other side of the gate and they had to try to get it before Cosmo did. 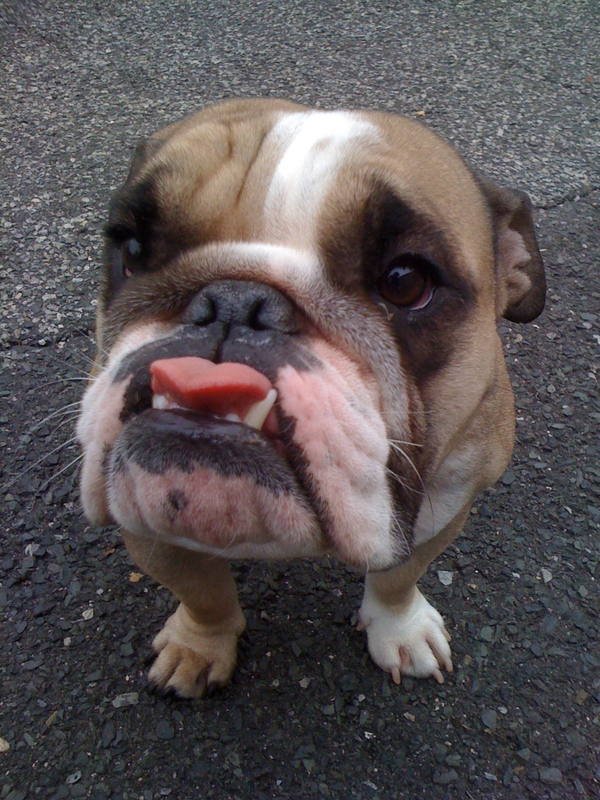 That’s my experience with bulldogs, as cliche’d as it is: you tell them what to do, and that makes them suddenly want to do the exact opposite. And when you try to get them to STOP doing what they then have made up their mind to do…best of luck!